5ft Nubian Copper Meditation Pyramid for Third Eye Activation. This full set is the best and cost-effective in the whole world. This Nubian Copper Meditation Pyramid five Feet or sixty inches base Height seven feet this pyramid is for those who as been practicing meditation for quite long time or have Reiki attuned this Nubian meditation is very powerful then Giza pyramid as this pyramid activates third eye chakra ( Giza pyramid activates Heart chakra). This pyramid is 20 times more powerful as it brings all the settle energies to the third eye. With this pyramid your will get five highly polished solid copper corner connectors with O-ring which holds the copper 1/2 inch pipes together tightly and connectors is turned to fit the same pipes (this is a new revolutionary design with precision work done by engineers) , one four inch copper pyramid to cover the apex of the pyramid, one orgonite 2.5 inch sphere is entirely handmade and contains a crystal for each chakra (amethyst, lapis lazuli, celestite, green aventurine, citrine, tiger's eye, red coral) and metal shavings (copper and brass,) and assembly instructions and eight copper 1/2 inch pipes which as been cut to fit and make the complete pyramid as this pyramid is exact replica of the Nubian pyramid with very precise 72° slope angles which as been used TIG copper welding for connectors and capstone, to make the connectors we used laser pipe computerised cutting machines to make those precise calculate 72° slope angles. The main pipes, connectors and capstone is then grind-ed, buffing, polished to a glossy finish and coated with natural oils so the it won’t tarnish in time and the original copper colour will remain for long time. 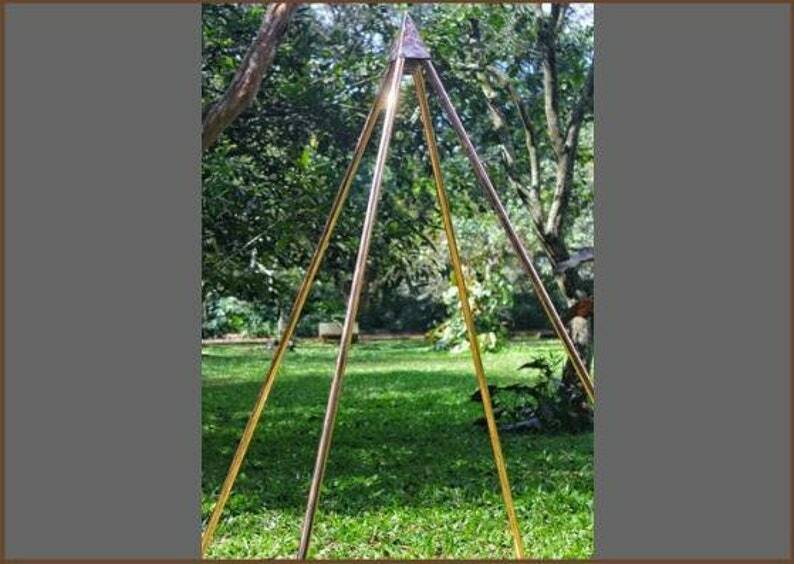 This pyramid being portable, it is able to be placed indoors and outdoors for relaxation and meditation and for inner peace and healing. This pyramid can be assembled and disassembled within no time without any additional tools. This makes these powerful personal tools the base meditation pyramid to achieving deep meditative states and accelerating healing on the spiritual, mental, and the physical levels. This complete pyramid set will be send in 2 different packages the connector, capstone pyramid and crystal will be send in a small box and the main 8 copper pipes is send from a PVC pipe with end caps on the both side each. Shipment will be sent through FedEx priority services within 2-3 business days. Really fast delivery, with great communication from seller.